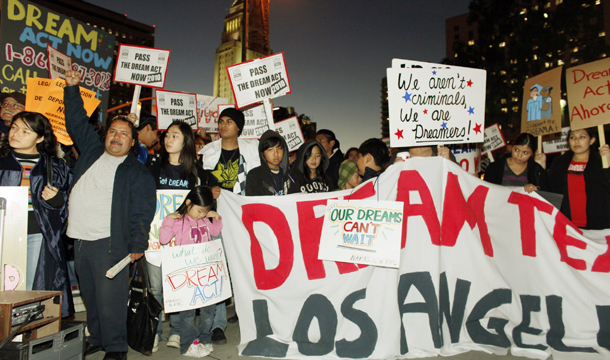 The DREAM Act helps a discrete group of high-achieving youths get right with the law and become full-fledged Americans. Only young people who came to the United States at age 15 or younger, have been in the country at least five years before the bill’s enactment date, and are currently age 29 or younger are eligible to become citizens under the law. Each year about 65,000 undocumented students graduate from U.S. high schools and face uncertain futures as their lack of legal status comes between them and their dreams. The Congressional Budget Office estimates that by 2020, 700,000 children and young adults will earn permanent residence under the bill. With 31.5 percent of science and engineering graduates being of Latino descent in 2006, passage of the DREAM Act could add as many as 252,000 new scientists, engineers, and technical workers to our nation’s dwindling supply. DREAM Act beneficiaries would not be permitted to sponsor their spouses or minor children for permanent residency for at least 10 years and, in most cases, would not be able to sponsor their parents or siblings for at least 23 years. Enacting the DREAM Act would reduce deficits by about $2.2 billion over the next 10 years, according to estimates by the CBO and the Joint Committee on Taxation. The CBO and JCT estimate that enactment of the bill would increase federal revenues by $1.7 billion over this same time period. A recent study by the UCLA North American Integration and Development Center estimates DREAM-eligible children and young adults would generate between $1.4 trillion and $3.6 trillion in income over the course of their working lives. Since the cost of deporting one individual is about $23,148, the cost to deport the 700,000 DREAM-eligible youths would be $16.2 billion. We already spend $17.1 billion per year to fund our immigration enforcement agencies—a nearly 80 percent increase in five years. Putting 700,000 youth and young adults on a path to legal status would allow DHS to prioritize its resources on threats, not America’s future. Sixty-six percent of voters support the DREAM Act, while 72 percent of Latinos said it was “extremely important” or “very important” that Congress pass the bill. More than 48 newspapers have published editorials in support of the DREAM Act since September 14; 40 press conferences have been held in 32 states; and more than 100 Spanish-language radio and TV stations have aired messages in support of the DREAM Act. Pro-immigrant groups have generated more than 850,000 calls, emails, and faxes to Congress in support of the DREAM Act and delivered more than 74,000 petitions to target Senate offices, demonstrating unprecedented strength and momentum in the immigrant rights movement.